Everyone from Forbes Magazine to individual authors are selling the "thar's gold in them there backlists!" schtick. But, is there really? Are book which were first published in the seventies or eighties best kept there? A book which goes out of print goes out for a reason, does it not? Yes. And, then again, no. 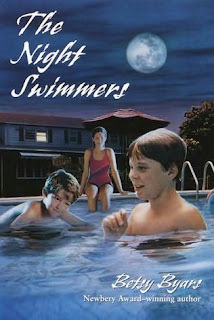 THE NIGHT SWIMMERS is a Boston Globe-Horn Book Honor Book, a 1981 American Book Award winner, a Parents' Choice Award, a Child Study Children's Book Committee: Children's Book of the Year award winner, an IRA-CBC Children's Choice, and a School Library Journal Best Book of the Year. (NOT a National Book Award winner; the ABA is a whole 'nother award.) So, on one hand, that's a lot of acclaim. Clearly, there's something enduring here... but I am of the opinion that the "something enduring" is not necessarily for kids, not with this book. Please be clear: this is a good book! The writing is clear, the plotting is true, the inner mind is precise. However, THE NIGHT SWIMMERS is also a candidate for a crossover book - I suspect it ought to be read by undergraduate social work majors rather than middle graders. The author has a very keen and perceptive eye toward motivations and reasons, the way primary school kids think, and exposes the vulnerabilities of these children in a single parent family in a way that is both heartbreaking and eerily bloodless. There's a sense of "it is what it is," a weary resignation, and a great deal of super-mature reasoning on the part of the main character. The bird's eye yet distant point of view endows the piece with such an isolated feeling that this is not an early reader or MG novel most kids would enjoy, and yet... it's a clear snapshot of the late seventies-early eighties with no nostalgia, and I think the plot could well be played out in countless homes, in various ways, today. Concerning Character: Retta is thrust into sibling leadership at the death of her mother. When their father moves them to a new town to revitalize his flagging country music career, Retta's concerned for her siblings' reputation in their new town. She wants to give them so much - new experiences, the right clothes, the right knowledge - so she marches them out, in the middle of the night, to a neighbor's pool, for swimming excursions. In her mind, she's being a good mother by giving them these experiences. Retta's siblings by turns resent and adore her, but when this story begins, their mother has been dead for two years, and resentment is rapidly taking over adoration. Their father, a honky-tonk lounge singer who works nights, is a self-absorbed peacock of a man with few redeeming characteristics. He remains unavailable in hopes that problems will solve themselves. He honestly does not SEE his children - at all. He sees himself. His loss. His life. His dreams. Three children - no mother - and though he loves them, in apparently the deepest way his very crowded and shallow heart can muster, they have no real father, either. A sister who thinks she's responsible for her little Clearly, these guys are in trouble. Retta is bossy - and quite an officious little bustling busybody. She is, as a sibling, both perfectly caricatured, and perfectly unlikable. Yet, most of the story is told through her desperate eyes. She sees the world through the lens of her television, and often acts in ways in which TV mothers act - because she has no other role model. This loss is neither particularly saddening nor sharp, but is deeply pervasive within the plot. Retta does what she does and acts as she acts because this is how TV mothers act, and God knows, she and her siblings need a mother - any kind of mother. She clings grimly and pathetically to the role, giving them peanut butter sandwiches, pinches, shakes, and scolds... and she's doing the best that she can. When the elder of her two younger brothers finds a new friend to hang out with, and invites their youngest brother along, she feels her tiny empire crumbling - and her family further falling apart. Desperate to keep "parental" failure at bay, one night she follows her brother to meet his new friend - leaving their dreamy youngest brother unsupervised. It quickly becomes apparent that Retta is not a mother - and that someone must shoulder that responsibility for her family, before it's too late. Cover Chatter: This was a critically acclaimed book, and so there are many 80's covers to love. The first cover was done in the style we can only call Early Depression. I mean, seriously? I know 1983 was a rough year - Regan was president, after all - but I think the children needlessly suffered the brunt of that adult malaise. Sheesh, book designers. Just... sheesh. Early Depression gave way to Paperback Depression; the first Dell paperback at least gives us a better depiction of children, with an accurate portrayal of Ray cuddling Retta, and Johnny off to the side. 12-year-old Retta looks far older than she should, but we can blame that on the muted colors. The cover most familiar to the rest of us will of course have been put out by Scholastic. 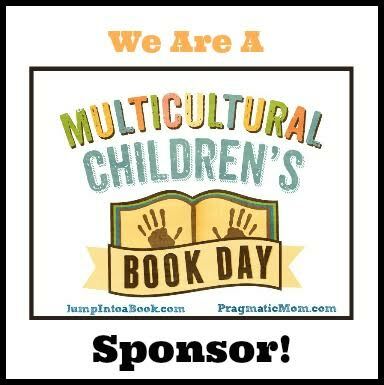 The red edging and accurate artistic rendering makes me want to get out a magnifying glass and look for the tiny, tiny book symbol... that it looks like the children are swimming in broad daylight is an unfortunate side-effect of their enthused - and wonderful - use of color. Probably the best depiction is this later - early 90's? - cover which focuses more on the boys than on Retta - which is interesting. Though the story's point of view briefly visits each child, Johnny is the least talkative, and rarely commands the narrative. Retta as both sitting stiffly upright, in the "in charge" position and far from the fun speaks to her real position in the family. The final cover is the ebook version, which is the most stylish from a graphic design perspective, but also somewhat confusing, as it has a very adult air about it. A reader not familiar with the author might see three bathing suits and expect something entirely different. FTC: This novel was courtesy of the author and Open Road Media. 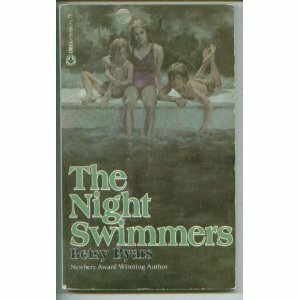 You can find tons of Byars backlisted titles now in ebook form, and you can buy THE NIGHT SWIMMERS at any library, online, or at an independent bookstore near you! Betsy Byars is one of those writers I remember being excited about years ago (like when I read Summer of the Swans) but have to be reminded about. Thanks for the reminder. Yep - the Swans was my first Byars, so I will always love it. 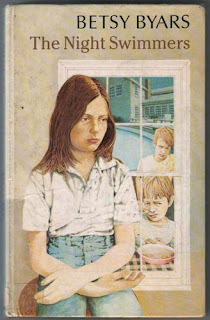 Byars caught at those rarely articulated feelings that kids have that few other authors at the time were talking about - as relevant, in her time, as Cynthia Lord's RULES later on, in talking about an imperfect sibling who got all the attention - and needed more - and whom it was sometimes hard to love. SUMMER OF THE SWANS was such an honest book.